When Gerald Weber turned 50 years old,he designed an amp that was to be the absolute ultimate combo as his mark on the amplifier world. The Gerald Weber Signature combo sold for nearly $8,000. 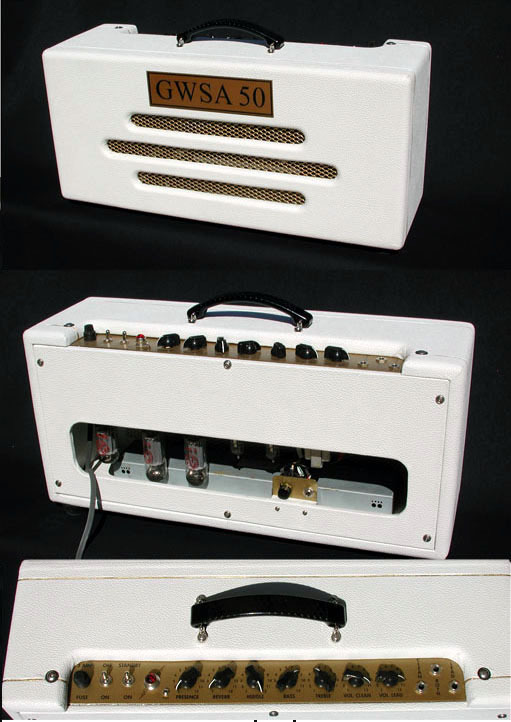 Because it was so heavy and expensive, by popular request,we have come out with the 50 watt head version of this fine amp. It has all the features but both the weight and the price are a mere fraction of the original combo. The clean channel is arguably the best clean sounding channel ever designed. Most amps get clean by scooping midrange, ala Twin Reverb, but the GWSA circuit gets clean without sacraficing mids. So you get the big fat clean tone that isn't thin, but meaty - ideal for a power trio or any application where you need clean headroom that is full. Jazz players,country pickers, and blues players would fall in love with its clean tone. The lead channel is voiced to give rich, violin-like sustain that is dynamic and touch sensitive. Pick very lightly and it will clean up, but pick slightly harder and there is bite and edge to the front of the note. Pick hard and she screams with that creamy violin-like sustain that we all crave. There is also a BOTH input that allows you to play through both channels at once and blend them however you wish. This feature allows that multi-amp, multi-timbred Stevie Ray Vaughan tone that sounds clean, dirty, compressed and dynamic - ALL AT THE SAME TIME! Tube/Spring reverb with Kendrick Quik bias system for user biasing the output stage using only a digital multimeter and a jeweler's screwdrive. Yes, it takes only a minute to set the output tube bias and you don't have to take anything apart. Full four band EQ (Treble, Middle, Bass,Presence). Beautiful Gold metal-flake epoxy powdercoat faceplate with baked on black epoxy lettering will never chip or peel. Your choice of Tolex colors include White, Creme, Black, Brown, Snake, Purple, Red or lacquered tweed fabric. We are introducing these fine amps at a limited time with a $500 rebate. Place your order online and we will rebate your credit card $500! Offer is for a limited time only.